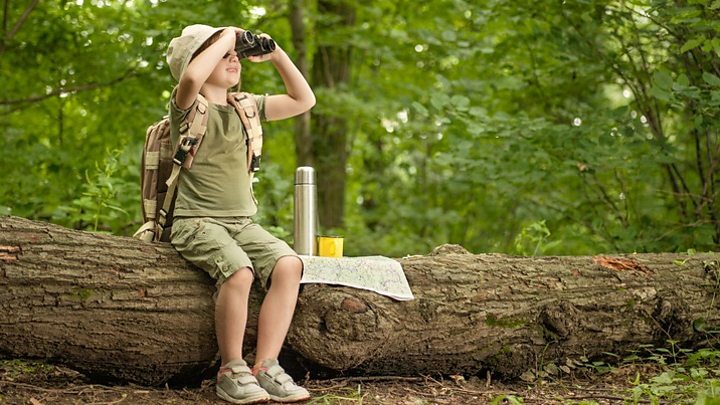 Girlguiding is planning a huge overhaul of its programme, with classic badges replaced by new ones with titles liable to puzzle older generations. So far, 15,000 girls have put forward ideas for new badges, including App Design, Vlogging and Upcycling. Olympic gymnast Beth Tweddle, one of several "inspirational women" involved, suggested a Resilience badge. And Lil, aged nine, wanted a Gymnastics badge as: "I enjoy doing it and I can do lots of tricks." Has Girl Guiding stood the test of time? More recently, in the 1980s, there was a Radio Communicator badge, and the 1990s girls could do a Canoeist badge. The current set of badges include Survival, Circus Skills and World Issues. Parents and the general public are now being invited to contribute ideas for the new programme on social media, using the hashtag #BadgeGoals. Girlguiding has more than 500,000 members aged five to 25 and 100,000 volunteers. It runs Rainbows for five to seven-year-olds, Brownies for seven to 10-year-olds, Guides for 10 to 14-year-olds and Senior Section for 14 to 25-year-olds. Elena, 17, said: "A Chemist badge would be brilliant as girls could find out about acids and alkalis and have a go at conducting experiments. "It would be a fantastic way to engage girls in chemistry." Mihika, eight, said her top choice would be a Zip Line Badge, "because it is very fun and cool". Sophie, 20, wanted a Video Journalist badge: "It would give girls the opportunity to learn about making vlogs and other video news pieces and understand how to harness one of the most powerful communication mediums available." 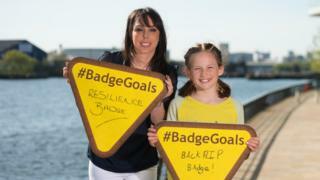 Beth Tweddle said her proposed Resilience badge would "give girls the chance to build their mental wellbeing". She said resilience was a "valuable skill" which had helped her handle "the pressures of competing in gymnastics". "A Resilience badge would help to tackle the stigma around mental health from a young age by empowering girls to talk confidently about these issues and equipping them with the skills they need to be resilient throughout their lives." Girlguiding says the new programme, starting next year, will mark "the biggest investment in girls' futures outside the school system in the UK". The aim is to equip hundreds of thousands of girls "with all the skill and experiences they will need to thrive, succeed, make change and be happy in the modern world", it adds. In 2014 the Scout Association carried out a similar move, introducing 19 new badges after a 10-month consultation with its 12,000 scouts. Among the new badges was geocaching - a modern take on orienteering where participants use GPS technology to find hidden treasure boxes. Beth Tweddle is among several prominent women awarded honorary "I Give Girls a Voice" Guide badges for being role models for girls and young women. Other recipients include fellow Olympians Lizzy Yarnold, Dame Kelly Holmes and Hannah Cockroft, as well as entertainer Kimberly Wyatt, campaigning journalist Bryony Gordon and adventurer Anna McNuff.